The popular Pyrex brand has Limited Edition Halloween Storage Dishes. 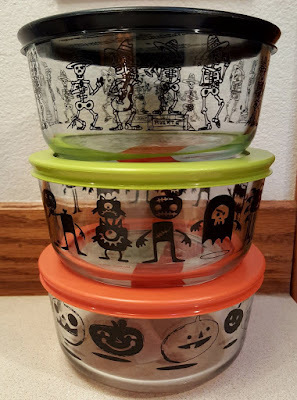 These spooky storage containers are the perfect trick for storing treats. Whether you’re sharing homemade Halloween goodies, or filling with candy for fun party décor – the festive patterns are guaranteed to get you in the Halloween spirit. And because they’re made of Pyrex glass, the vessels are dishwasher, refrigerator, microwave and pre-heated oven safe!